Do They Have Electricity in France? 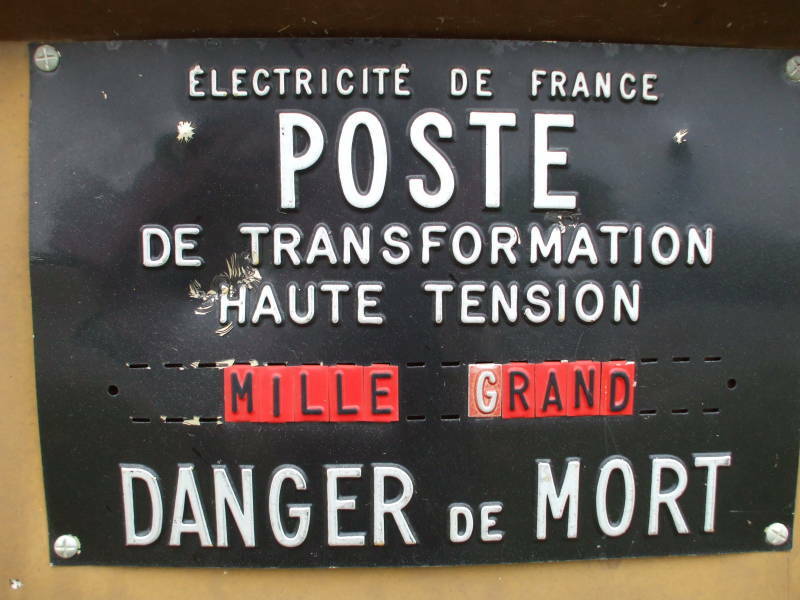 Yes, of course France has electricity, but why do I mention this? I write and teach courses on Linux and other forms of Unix, information security, and networking. A lot of the courses run in the Washington DC area, so I have a lot of students from various U.S. Government agencies. I sometimes put up a slide show of pictures during the lunch hour, typically a large collection of pictures from a couple of canal boat trips in France on some of the days, and from one of several trips to Turkey on the others. Part-way through the lunch hour's collection of pictures of French canals and their surroundings, he asked, "Do they have electricity?" 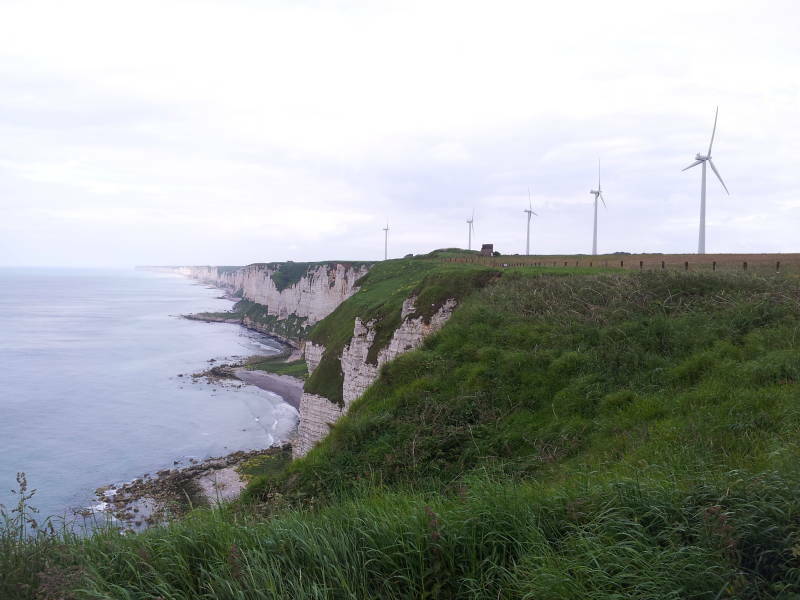 Wind turbines generating electrical power on the cliffs of Cap Fagnet above Fécamp on the Normandy coast. I started explaining that the only electrical power on board was 12 volts DC, used to run small interior lights and fans plus the automotive stereo system. If you wanted 230 volts AC, you would have to plug in to a shore power box at a marina or village pier, although that wasn't generally available. No, no, he didn't mean on board the boat. He meant in French villages. That's right, he figured that the major cities in France probably had electrical service, but he honestly didn't know if citizens of France outside the two or three largest cities had access to electricity. Remember that his job involves understanding and anticipating foreigners' use of technology. Centrale nucléaire de Belleville, near Belleville-sur-Loire, with two reactors producing a total of 2,620 megawatts of electricity. We tried to explain to him that France has managed to tame the electron (as has the rest of Europe), that France is decades ahead of the U.S. in nuclear power generation and distribution, and that the largely electrically powered French rail system makes America's look relatively primitive. 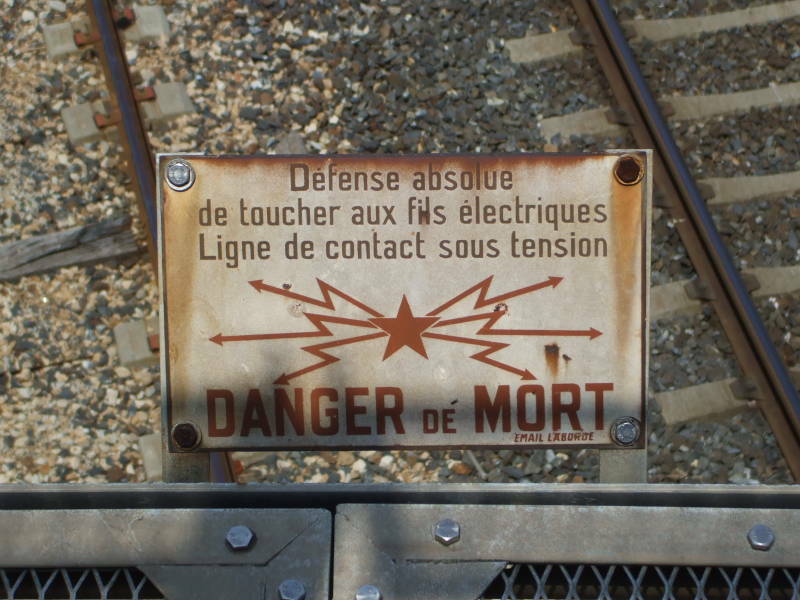 So enjoy my pictures of France, and keep in mind that they do have electricity there. They just don't squander as much per person as in the U.S., nor do they burn nearly as much dirty coal to generate it. France has the world's highest percentage of its electricity generated from nuclear power, at just over 80%. Ukraine is second at 46.7%, followed by Sweden 42.6%, South Korea 34.0%, Japan 24.0%, Germany 23.5%, U.S. 19.3%, Russia 15.7%, Canada 14.4%, and China 2.0%. 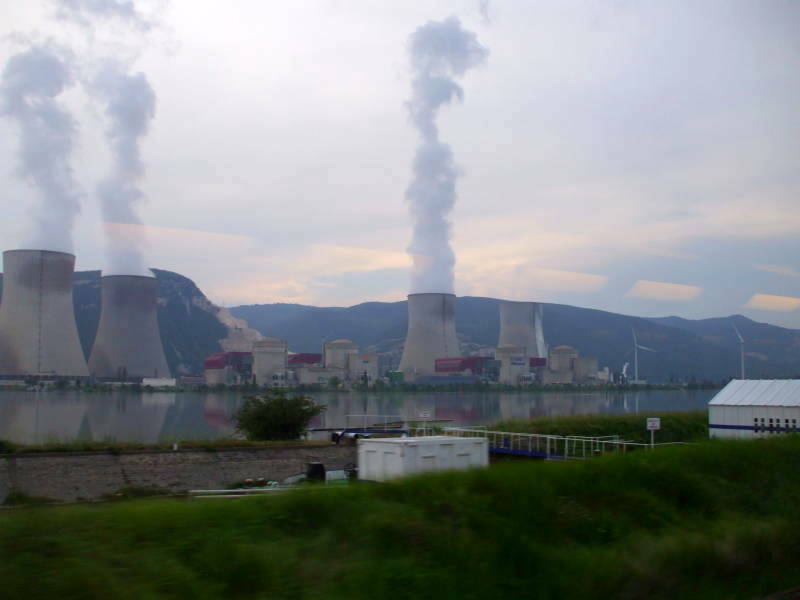 France had over 16% of the world's installed nuclear power generation in 2008. Électricité de France is the main producer, and it is the second largest electric utility in the world. It operates world-wide, including EDF Inc in the United States, where it fully controls Unistar Nuclear Energy, EnXco, EDF Trading North America, and has a 50% interest with Exelon in Constellation Energy Nuclear Group. Unistar operates four nuclear power plants in the eastern United States. EnXco builds and operates wind and solar electrical power projects across the U.S. The Tricastin nuclear facility along the Rhône river north of Avignon is one of the most significant nuclear technology sites in the world. Here you see the Tricastin facility as seen from the TGV speeding down the opposite bank of the Rhône. The TGV is an electrically powered train moving at 300 kilometers per hour. 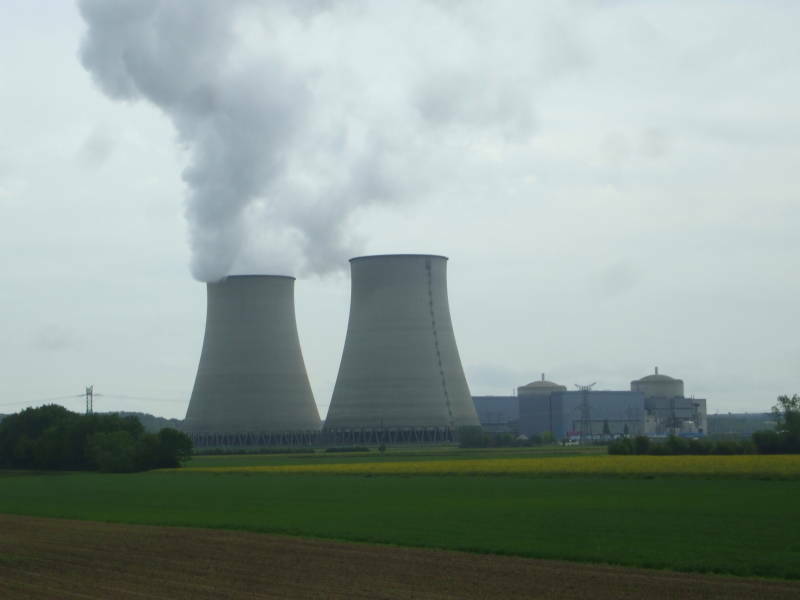 Électricité de France operates a nuclear power plant here with four pressurized water reactors producing 915 MW each. They produce about 25 terawatt-hours per year, about 6% of France's electricity, but roughly two-thirds of that goes directly into the Georges Besse Eurodif uranium enrichment plant. Transmission losses were minimized by putting the enrichment plant right next to the power source. This is being replaced by a new facility within the same site. Comurhex is a uranium fluoride conversion plant. It processes a quarter of all world production of uranium and almost all of that used in France. Natural uranium, called "yellowcake", is first purified and converted to uranium tetrafluoride, UF4. That is then converted into uranium hexafluoride, UF6. The uranium hexafluoride is then enriched to become useful as fuel. Commissariat a l'Énergie Atomique (CEA) de Pierrelatte is a military nuclear research and uranium enrichment facility. CEA in France is much like the Department of Energy in the U.S., involved in both nuclear power and nuclear weapons development, production and maintenance. La Base Chaude Opérationnelle du Tricastin or BCOT specializes in nuclear maintenance. They maintain and store equipment from nuclear plants, some of it contaminated. The French should ask: "But do they have banking in America?" There's a traveler's inconvenience caused by the U.S. being behind the rest of the world in some ways: Almost all countries' banks now issue credit cards that are smart cards, with electrical contacts and an embedded chip. It's a very nice security feature, you must use a PIN to use the card and so a stolen card simply cannot be used. All Australian credit cards have been smart cards since 1985. The problem is that old-fashioned American credit cards don't work in a lot of the automated kiosks, for example, the handy system that sells tickets in French train stations. We have to go stand in line with all the other Americans at the staffed ticket window where we can still use our quaint no-security cards. While you are standing in line there, you will probably notice that most everyone else in that line is speaking American English. Update — Finally, in 2014, the U.S. payment card industry announced that it would be working to catch up with the rest of the world over the following two years. In 2018 that was underway, most new credit cards issued in the U.S. included chips.